The asynchronous implementation is a relatively simple one based on Processing Bitmaps Off the UI Thread article with some adjustments to concurrency and cancelation handling. Using AsyncTask with all the good and bad that comes with it, so probably one single background thread executing each request serially, though bitmap processing should be fast so this won't be an issue. No cancelation of running asynchronous loading or cropping – after quick look it doesn't look possible. Using WeakReference everywhere to prevent memory leaks in android lifecycle. Using instant state to handle rotation during asynchronous loading to restart the operation. Using setImageUriAsync asynchronous API is as simple as using setImageUri, as it will set the loaded image to the image view as soon as it is loaded, except if an error occurred you won’t get exception thrown but need to subscribe a listener using setOnSetImageUriCompleteListener that provided the error as parameter. 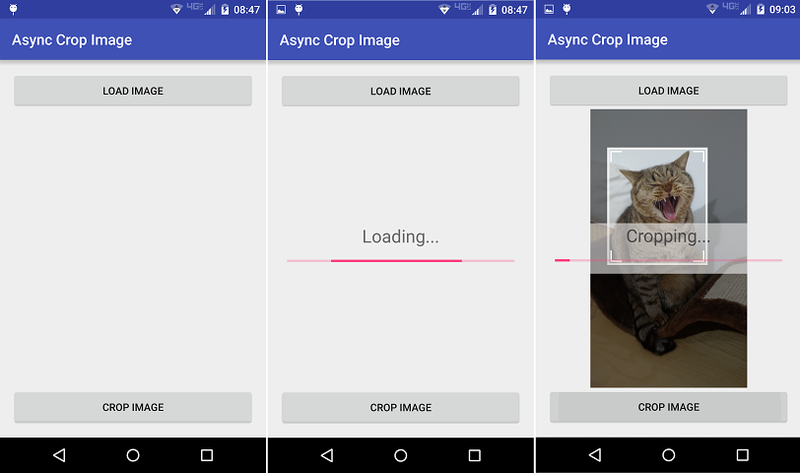 The same mechanism is used for getCroppedImageAsync where both successful and failed result are received via listener subscribed by setOnGetCroppedImageCompleteListener. Another thing worth mentioning is that subscribing and unsubscribing should be done in activity onStart and onStop methods respectively to prevent code execution on irrelevant widgets due to android lifecycle. By default the a simple progress bar will be shown in the center of the cropper widget (figure 1). It will be shown, using the default color scheme of the project, when image is set and cropped using asynchronous methods (async suffix). Figure 1: Default progress bar UI, small progress bar widget center to cropper view. To change the default, first we need to disable it using showProgressBar=&quot;false&quot; custom attribute. Then we add our custom widgets as sibling to CropImageView and adding FrameLayout as parent so our custom progress UI can be center and on top of the cropper widget. Next we need to show our custom UI before starting asynchronous operation and hide it when it completes by using listeners. Figure 2: Custom progress bar UI, horizontal progress bar with text with fade background over cropper view. This entry was posted in DevLife and tagged android, asynchronous, crop, Images.